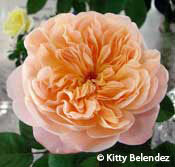 The first climbing English-style rose, is The Impressionist (CLEpainter). Bred by gifted hybridizer John Clements in St. Paul, Oregon, The Impressionist was introduced by Heirloom Roses in the year 2000. It is classified by the American Rose Society as a large flowered climber (LCl), and is a cross of Distant Drums x Graham Thomas. The Impressionist gets its name from its enchanting color. Classified as a medium yellow [my] by the ARS, this rose presents an aurora borealis of color reminiscent of the impressionist painters of the 19th Century. 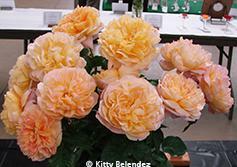 Most growers observe this rose to be a rich yellow in the spring and a pumpkin orange in the fall. However, The Impressionist presents more subtleties throughout the growing season, offering up a perfect blending of hues that include several shades of apricot, salmon, creamy pink, peach, coral, orange red and gold. Its opulent, golden hues are reminiscent of the warm glow of sunlight in the first light of dawn. The dazzling, uniquely colored blooms measure about three inches across with approximately 40 sun-kissed petals. They are framed by glossy, dark, rich green foliage with a slight blue cast, making them striking in collections or arrangements. Another positive attribute of this rose is disease resistance. I have found it to be among the most disease resistant of the roses in my garden, although certain areas of the country have remarked that it susceptible to blackspot a malady we seldom experience here in the Pacific Southwest. Although I have read commentary from numerous sources claiming this rose is very fragrant, I must admit to not noticing any significant fragrance on the blooms from my four large plants. Nonetheless, since interpretations differ on the intensity of rose fragrance (i.e. rosarian/ARS judge Bob Martin can't detect any fragrance on the pungent "Fragrant Cloud"), I will pass along the observations of others and let the individual be the judge. Its hybridizer notes "a strong old rose, myrrh perfume", and others have found it to be "exceptionally fragrant". I have even heard it opined that "the fragrance is powerful and seductive" and that it has a "very strong citrus-like fragrance". So as you can see, on the subject of fragrance, opinions vary. As for growth habit, The Impressionist generally grows to about nine to twelve feet in height, although I have seen some canes top out around fifteen feet. It blooms freely in the spring with a prolific first flush and a reliable repeat bloom in the summer. However, its fall rebloom is light and sporadic, if at all, and not to be counted upon. I have heard it said that The Impressionist is more of a pillar rose than a true climber, since its canes are rather rigid and inflexible. I tend to agree with this estimation, since this is a rose that stands up straight and does not take up a lot of room in breadth. You can see its lofty blooms glow from across the garden. I have attempted to train it horizontally on a fence, but have not been overly pleased with the results. I would personally recommend that The Impressionist be trained up a wall or a tall support structure, and I have even had success in the past pruning it like a hybrid tea rose. I am pleased to report that The Impressionist is an exceptionally fine show rose. I first saw it shown in a category for "unknown or mystery roses". After an extensive search, I found it was in fact a climber available from Heirloom Roses. I really believed a climber with the form of an English rose and the color of an early morning sunrise would be great for exhibition, and so I promptly ordered four of them. They came as small cuttings and took a year or two to establish themselves, but then they were "ready to rock", both in the garden and on the show table. Thanks to the incredible database at Roseshow.com, I obtained initial show statistics for The Impressionist. 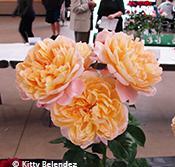 The rose debuted on the show tables in 2004, tying for 9th place with four trophies. (I won all of them.) In 2005, others had taken notice of this striking climber, and The Impressionist moved up to 7th place on the roster of top climbers with seven trophies to its credit. (I won four of the seven, but I had some competition now.) Figures are not yet in for 2006, but I'm sure the rose has done even better. I know I've already won 13 trophies with it so far. No wonder the American Rose Society has recently selected it as the "Best New Climber" of the last five years! Furthermore, The Impressionist wins as one bloom per stem and also as a spray. In conclusion, if you are a lover of English style roses and want to grow a beautiful climber for both garden and show, you can't go wrong with The Impressionist. Its unique color blend and romantic, old-fashioned form will endear it to home gardeners and exhibitors alike. I could not recommend it more highly. The Impressionist is available exclusively from Heirloom Roses in St. Paul, Oregon, or by mail order through their website at www.heirloomroses.com.